Currently most USB mics are limited to recording 16-bit audio at 44.1kHz or 48kHz. 24-bit isn’t a must for music production but it allows for a greater margin of error, so if you don’t get your recording levels just right it’s usually a non issue. Still 16-bit is all you need as a delivery format, and for an entry-level mic its adequate. 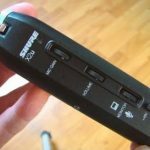 While any USB mic will work for singers many are geared towards podcasters, gamers, or people that simply need a microphone for Skype. 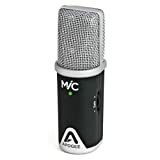 All popular USB mics are condenser mics and if the internal capsule is too small and chintzy, the recordings lack the rich body we expect from a vocal performance even though its a fine tool for speech. 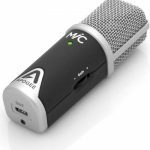 With that said, let’s look at the best USB mics for vocals. Well-known for building the quintessential entry-level XLR condensers mic for home recording, the NT1, Rode has moved into the USB mic space with the NT-USB. 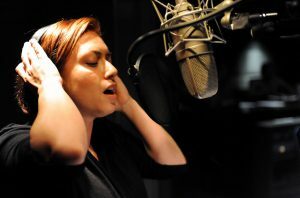 The primary focus is vocals, not another podcasting mic marketed to musicians as an afterthought. It’s a rich sounding cardioid mic that captures an impressive frequency range 20Hz – 20kHz. Two knobs at the side control mic level in the mix as well as overall headphone monitoring level. It also includes a pop filter positioned at the ideal distance which any singer will need to reduce hard ‘B’, ‘T’ or ‘P’ sounds. 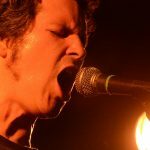 MiC provides a big step up versus your standard USB mic in terms of professional features, so understandably it has a price to match. Like all Apogee gear it’s made to work exclusively with Apple products: iPad, iPhone, and Mac using either a Lightning or USB connection. It’s capable of recording at 24-bit/96kHz which makes it a serious tool as 24-bit recording is the standard in pro recording studios due to the headroom and flexibility it provides. 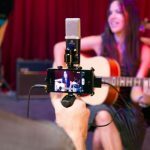 Tiny and intended for serious musicians that need a travel recording rig. 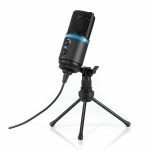 Hugely popular upon release before falling under the shadow of the Snowball, the Yeti is a wonderful podcasting mic that is also a good choice for singers on a budget. Super feature rich with a tri-capsule array inside that allows you to select cardioid, bidirectional, omnidirectional and stereo recording modes. Cool for some of your wilder, creative miking ideas; not typical for USB mics to have options like this at any price. It’s metal, and better built than you might expect from a mic with cartoonishly rounded edges. Like the Yeti of legend, it’s pretty big so folks with tiny desks need not apply. This is just like AT2020 but with a USB connector rather than XLR. Pro studios owners tend to like Audio-Technica mics and although this is near the bottom of their line it’s still built like a brick house just like their high-end stuff. Audio-Technica mics sound great and this is no exception putting price into consideration. Smaller than you may think as it was dwarfed by the Yeti. Very simple with no dials or switches to mess with or to potentially break. Another reason this is the USB you’d wager could survive an apocalypse, as long as you ditch the wonky tripod that is included.